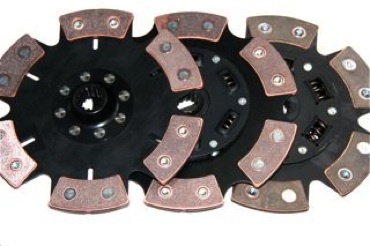 So we have some new clutch disks finally for my cars. In case you missed it the drag car has been hungry and the spec are just not what I want to put back in my street car. These new disks seem to be quite a bit more durable with better drivability as a bonus. Without getting into everything lets just make a couple points. First this is what I will put in my car. Secondly I am not keen on selling what I am not happy to run in my personal cars. We were even able to lower the price! The side effect to this is that the early demand has been greater than expected. We are working with suppliers to solve this temporary issue. Shown here from left; New Race Clutch Solid Hub, New Sprung Hub “stg3″ and the spec for comparison. In the same time we also found that the s&@^ flywheels were not clearing the front cover on most cars. Not a major issue, ) I never noticed it on my Viggen.) Still UNACCEPTABLE in my book! They were not keen to solve the problem so we are working to find another manufacturer or machine them in house. So for the time being we are not offering the Alu flywheels for sale. This entry was posted on Thursday, December 10th, 2009 at 10.53 am and is filed under (Nicks) Viggen, Powertrain. You can follow any responses to this entry through the RSS 2.0 feed. You can leave a response, or trackback from your own site.